A breakout biography of Louis-Napoleon III, whose controversial achievements have polarized historians. Considered one of the pre-eminent Napoleon Bonaparte experts, Pulitzer Prize-nominated historian Alan Strauss-Schom has turned his sights on another in that dynasty, Napoleon III (Louis-Napoleon) overshadowed for too long by his more romanticized forebear. In the first full biography of Napoleon III by an American historian, Strauss-Schom uses his years of primary source research to explore the major cultural, sociological, economical, financial, international, and militaristic long-lasting effects of France's most polarizing emperor. Louis-Napoleon’s achievements have been mixed and confusing, even to historians. He completely revolutionized the infrastructure of the state and the economy, but at the price of financial scandals of imperial proportions. In an age when “colonialism” was expanding, Louis-Napoleon’s colonial designs were both praised by the emperor’s party and the French military and resisted by the socialists. He expanded the nation’s railways to match those of England; created major new transoceanic steamship lines and a new modern navy; introduced a whole new banking sector supported by seemingly unlimited venture capital, while also empowering powerful new state and private banks; and completely rebuilt the heart of Paris, street by street. Napoleon III wanted to surpass the legacy of his famous uncle, Napoleon I. 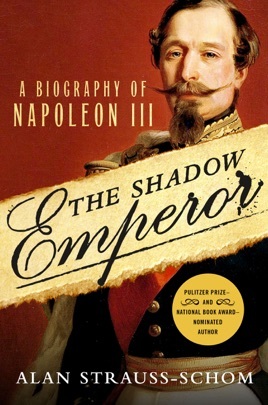 In The Shadow Emperor, Alan Strauss-Schom sets the record straight on Napoleon III's legacy. Napoleon III, emperor of France from 1852 to 1870, is most often presented in English-language sources as a figure of fun or pathos, a simulacrum of his world-striding uncle, Napoleon Bonaparte. Historian Strauss-Schom inverts these stereotypes in an excellent biography, portraying Napoleon III as a builder and a reformer, a planter of forests, and a reclaimer of wasteland. He reconstructed and redefined Paris. He created jobs and sponsored department stores, overhauled educational and financial systems, and encouraged scientific and technical research. In these pages, he emerges as the underwriter of modern France. Yet, unlike his uncle, a man of war and statecraft, Napoleon III was a mediocre diplomat and an ineffective commander. He came to power at a time when Europe's map was being redrawn, and he frequently misjudged international situations: his imperial ambitions generated unwanted confrontations with Britain; his Italian policies enabled unification, but did not complete the process; above all, he was repeatedly and spectacularly outmaneuvered by Prussia's Otto von Bismarck. Napoleon III's failures led directly to his own downfall and to France's displacement as Europe's primary power. This work's perceptive synthesis of recent research will interest scholars, and its engaging presentation and fast-paced narrative will attract general readers.